* For PHR Use Only! Mr. Miss Ms. Mrs. Dr. Hon. 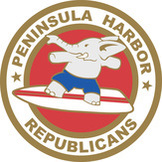 The Peninsula Harbor Republicans is a grass-roots organization. We encourage the participation of all Republicans in an honest and open forum, expressing divergent views in dialogue for the good of the Party and the Country. We unite following the Primary to support all Republican nominees in their election to office in the General Election. We believe in the protection of individual and property rights, fiscal restraint, and smaller government. If you are interested in learning more, please complete this form and send it to the address shown above. Extra Donations help fund the grass roots Get Out the Vote and Voter Registration Activities needed to elect Republican Candidates.